Daily Illuminator: John Kovalic's Tour De Duck! 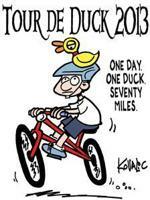 September 11, 2013: John Kovalic's Tour De Duck! John Kovalic's doing something really cool. He's raising money for a charity bike ride which will help get healthy food from local farms to low income families! He's not quite to his goal yet, so he NEEDS YOUR SUPPORT! Not sure yet? Here's what you get for supporting him. Everyone who pledges at least $10 will get to start their next game of Munchkin at level three! That's an official rule! Everyone who pledges will get a free coloring book through DriveThruRPG! If John's pledge level hits $3000, he'll do the whole 70-mile bike ride with a Duck of Doom strapped to his head! What are you waiting for? Go help out!